Webinars are more than just isolated events – they are powerful, tactical tools for executing Marketing and Sales strategies. As any session organizer knows, much of the work (and worry) lies in sending invitations, collecting registrations, emailing reminders, recording, and distributing follow-up communications. iLinc for Webinars puts you in control of the entire process, dramatically reducing effort as well as errors. Session organizers can manage the invitation and registration process, create customized, automated reminders and follow-ups, configure optimal session settings, etc. – all within the iLinc interface. Integrations with Salesforce.com, Outlook, and social networking sites broaden your toolset even further. 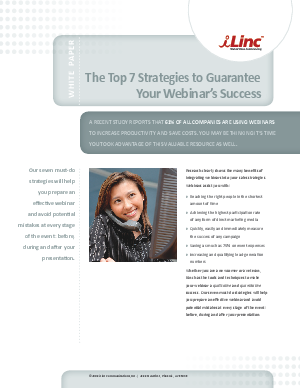 If you want your webinars to run without a hitch, download our whitepaper for some best-practice tips!